ChargeNet NZ has experienced an almost 300% increase in electric vehicle (EV) charging sessions in the year to June 2018. This impressive growth in charging sessions has been off the back of the exponential uptake of EVs in New Zealand, almost 120% over the year, as well as the spread of ChargeNet NZ’s nationwide network of DC rapid charging stations. Some 44 rapid chargers have been added over that year. 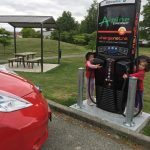 ChargeNet NZ’s DC rapid charging network, which sits at almost 100 chargers across the country, is complemented by an expanding network of AC chargers which increased from one to 16 over the same time. And ChargeNet NZ’s membership has also increased by nearly 4x in the year to June. These figures from ChargeNet NZ follow Vector’s announcement it had a 190% increase in EV charging sessions in the year to June 2018. It all shows EVs can no longer be written off as a mere fad as they’re undoubtedly the future of transport in New Zealand, ChargeNet NZ chief executive officer Steve West says. “As New Zealand generates one of the highest levels of renewable energy in the world, getting drivers to switch to electric is one of the best ways that we can reduce our dependence on imported fuel and work to achieve a carbon neutral future for our country. “When ChargeNet was founded, our primary goal was simply to increase the uptake of electric vehicles in New Zealand by providing a reliable, nationwide charging network. West says ChargeNet NZ the only New Zealand charging infrastructure provider to utilise 100% renewable and 100% CarboNZero certified electricity.